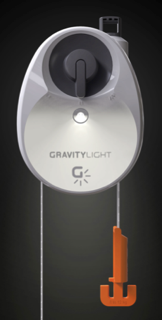 GravityLight is an innovative device that generates light from gravity. It takes only 3 seconds to lift the weight that powers GravityLight creating 25 minutes of light on its descent. It can be used over and over again with no running costs.